ROCHESTER, N.Y. (CitizenWire) — With the addition of Dr. Wade Cook, ASE Optics significantly expands its capabilities in holography, remote sensing, LIDAR (Light Detection and Ranging) and laser vibrometry. ASE Optics provides contract optical engineering and custom lens assembly manufacturing for companies worldwide. Cook’s military background and experience meshes closely with the emerging needs of ASE’s customers. Recent project work includes remote sensing, critical to UAV (Unmanned Aerial Vehicle) applications. New photopolymer materials are expanding the possibilities for using holography to create ever-lighter and smaller integrated optical systems. Cook has experience in designing and making holograms for pictorial and metrology applications. ASE can now design, spec and build hologram systems, or deliver finished holograms. Cook’s expertise in laser vibrometry enhances ASE’s extensive ability in custom metrology solutions. Featured in a recent SBIR as a means of stand-off explosive detection, laser vibrometry uses a laser to measure the frequency at which a surface is vibrating. This non-contact testing is ideal for delicate structures and harsh or dangerous environments. Cook also brings direct LIDAR (Light Detection and Ranging) expertise, allowing him to design LIDAR systems for 3D mapping and data analysis. Recent work includes a partnership with RIT and MIT Lincoln Labs to accurately simulate airborne LIDAR. 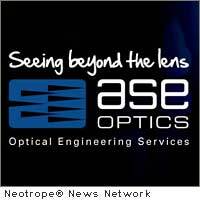 ASE Optics (ASEOptics.com) was founded in 1994 to provide optical engineering support for companies who couldn’t find, couldn’t afford, or couldn’t justify having an optical engineer on staff. ASE Optics “sees beyond the lens,” providing elegant optical designs that work within the system, maintaining integrity and seamlessly integrating for optimal system performance. Their optical engineers’ expertise is both deep and broad, crossing industries from security and defense to consumer electronics to medical devices. Visit www.ASEOptics.com to learn more. News Source: ASE Optics :: This news story was first issued by and is Copyright © 2010 the Neotrope® News Network – all rights reserved. Originally published on CitizenWire™.